It’s not often that I learn about a pastry that is totally new for me, but it happened this week on our favorite British baking show (the Great British Bake Off). I know the British don’t have a great reputation when it comes to food, but I think I love their pastries – at least the ones they borrow from Europe. The name is pronounced “queen-ahman”, with all the syllables run together so that it rhymes with “cinnamon”. They are french in origin, which means that by default they are delicious. Is it possible to find a bad French pastry? Kouign amann are the butter-laden, sweetened cousins of croissants: lots of paper thin layers of yeasty raised dough, with half a pound of butter and a little sprinkle of sugar folded between them. They are light and crisp on the outside, gooey and buttery when you tear them open. This recipe is not for the faint (or high-cholesterol) of heart. This was my first shot at laminated or layered dough. I’ve seen it done and it looks complicated. I want you to know, though, that it’s not. This recipe definitely takes a bit of patience, but it’s not hard. The trick to getting lots of flaky layers is to sandwich butter between each layer of dough, by enveloping butter inside the dough, and then folding the dough up, pressing it out flat, folding it up, pressing out…you get the idea. As long as the butter doesn’t melt into the dough (which it won’t, because this dough spends a lot of time in the fridge so the butter stays cool), when the pastries bake the butter will melt and make steam. The layers will separate and puff up, and you get a wonderful, flaky, light pastry. Really, it’s simple. 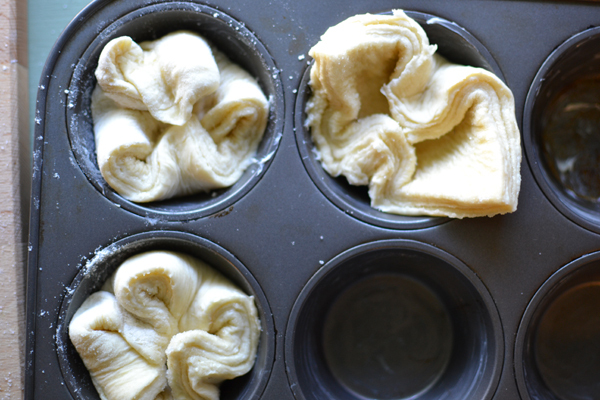 As long as you can roll and fold dough, you can make kouign amann. This recipe is Paul Hollywood’s from BBC – home of the Great British Bake Off. I’m a big believer that if a recipe like this works well, why mess with or “adapt” it. There’s not much you can do to improve on it, especially for something that’s so simple and classic. Just consider me the sharer of a great recipe (and a converter from grams and ounces to cups and teaspoons). 1/2 c. granulated sugar, plus a couple extra tablespoons for sprinkling. In a medium bowl, mix the flour, yeast, salt, water, and melted butter. Using a mixer with dough hooks, knead on low speed for two minutes, then on high for 5 minutes, until the dough is elastic and soft. It will be really soft, but won’t stick to wet or floured hands. Resist the urge to add more flour – this dough is supposed to be wet. Place the dough in an oiled bowl and cover with plastic wrap. Let the dough rise for an hour, until it is nice and puffy. 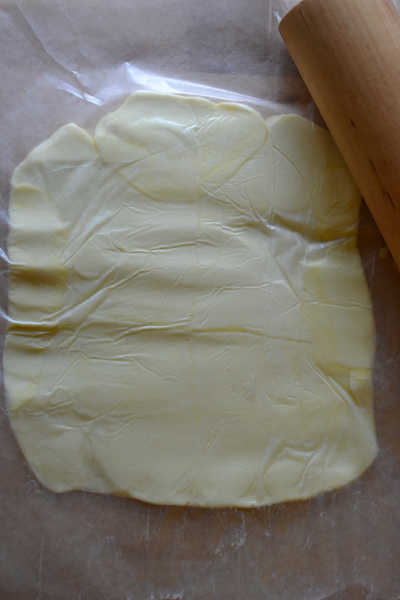 While the dough is rising, sandwich the cold butter between two sheets of waxed paper and pound it flat, then roll it into a 7″ square using a rolling pin. You want the butter to be flexible but not melting. Wrap the butter in plastic wrap or waxed paper and place it in the fridge for 30 minutes. 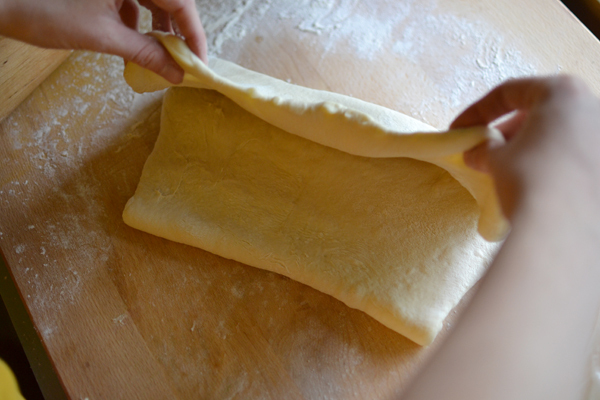 Once the dough has risen, turn it out onto a lightly floured surface, dust it with flour, and roll it into an 8″ square. Place the chilled flattened butter on the square of dough diagonally, so the corners of the butter touch the flat edges of the dough square. 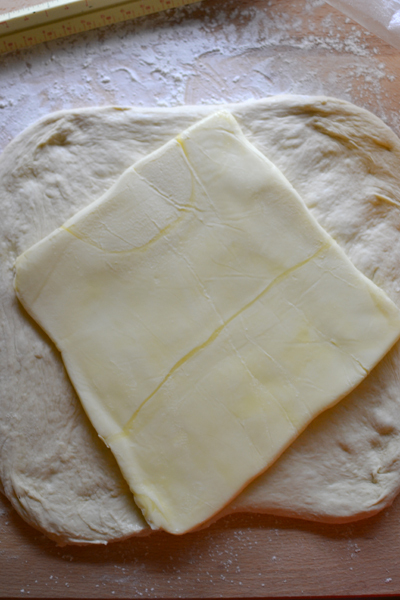 Fold the corners of the dough up and over the butter, envelope-style. Roll this “packet” out into an ~6″ x 18″ rectangle. Fold the dough into thirds, widthwise, by bringing the bottom up past the middle of the dough, and then folding the top down over the bottom part. Confused yet? In other words, fold the dough like you’d fold a letter. Wrap the folded dough in plastic wrap and place in the fridge for 30 minutes so that the butter can firm up. You really don’t want the butter to melt and seep into the dough, or you will end up with sad, unlayered pastry. Congratulations! You’ve just finished the first “turn”. Once the fridge time is up, repeat the roll-into-a-rectangle-and-fold step, and then put it back in the fridge for another 30 minutes. Repeat the process again, for a total of three “turns”. Preheat the oven to 425° while the dough is refrigerating after the last turn. 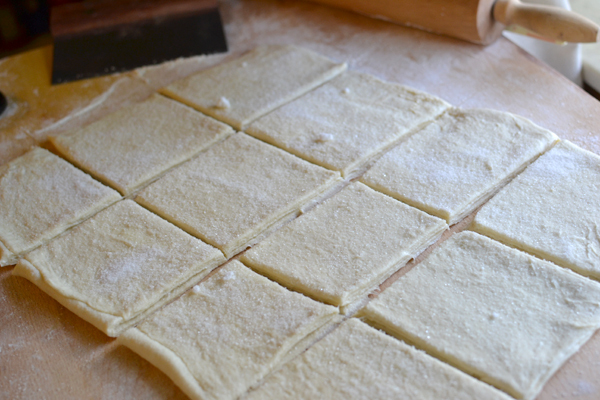 After the final turn and refrigeration, roll the dough out into the same big rectangle as before. Sprinkle the dough with the 1/2 cup of sugar, and fold it into thirds one last time. Instead of putting it back into the fridge now, you’ll roll the whole thing out into a 12″x16″ rectangle. Sprinkle the dough with a little more sugar and divide the rectangle into 12 even squares. 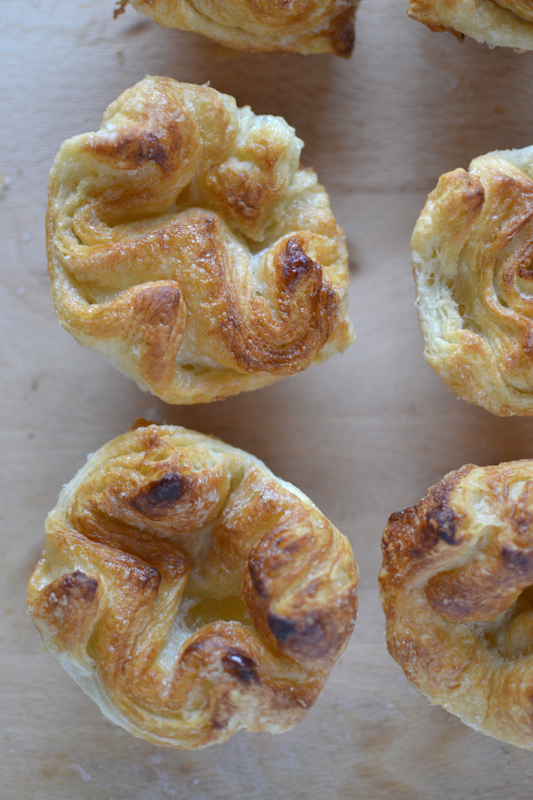 Sprinkle the shaped kouign amann with a little more sugar and give yourself a pat on the back – the hard part is over. Cover the kouign amann with a tea towel and let rise at room temperature for 30 minutes while the oven finishes preheating. Once they have risen, bake the kouign amann for 30-40 minutes, until they are puffed and golden brown. If they start browning too early, cover them with foil for the second half of the bake time. Allow the pastries to cool for a couple of minutes in the pan before turning them out to cool on a plate or cooling rack. Don’t wait too long to pull them out of the pan, or the caramelized sugar will make them stick. Enjoy these warm (or cool) with a cup of coffee. Tags: baking, dessert, French, pastry, recipe. Bookmark the permalink.